Home » Posts » Attentionology for K-5 Teachers » M&Ms Please! Happy Halloween to all who celebrate the eve of a day honoring the departed who’ve been a special part of our lives. Most celebrated today, at least in the USA? CANDY! Looking for a teaching trick that uses candy treats and helps kids pay attention in school? 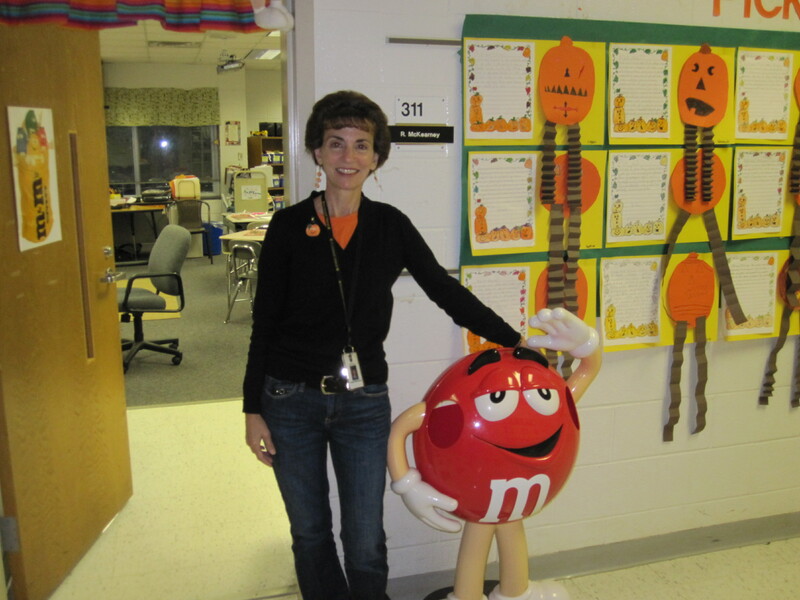 Meet Regina McKearney, third grade teacher, and her buddy – “Red,” a life-size M&M. Big “Red,” standing guard at Ms. McKearney’s door, was new to me this school year. He certainly got my attention as I headed into a room full of the “Mighty M&Ms” – Ms. McKearney’s nickname for her class! How did this clever teacher score such an eye-catching icon? Ms. McKearney says that she’s been a collector of M&M memorabilia since she was a child herself. 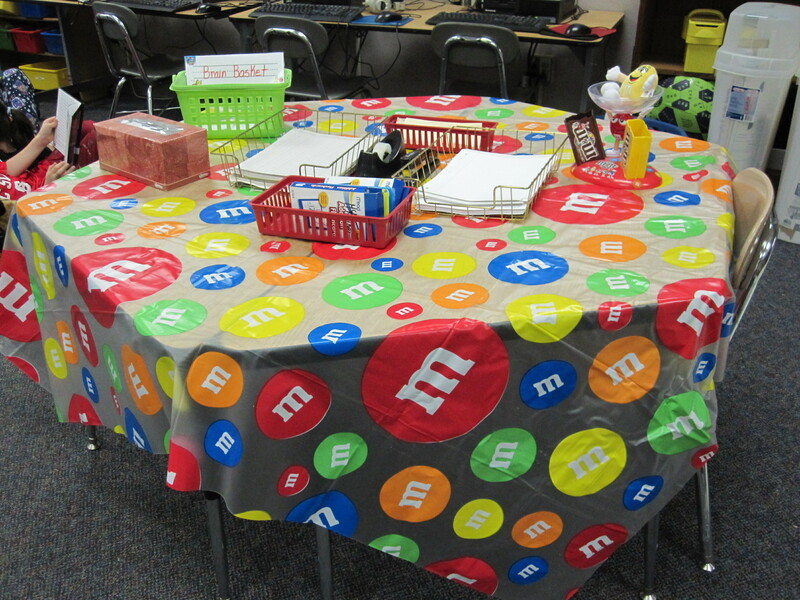 Check out the M&M tablecloth in my blog pic below; it’s a popular student reading spot and classroom organization destination. In all her years of M&M collecting however, Ms. McKearney explains, one long wished-for piece was missing…the lifesize M&M dispenser that now stands by her classroom door. Here’s the simple trick Ms. McKearney used to complete her collection…she asked and she received! Actually, her son contacted the Mars Candy marketing department and described his mother’s class of Mighty M&Ms. When the students returned from Christmas break last year, there was “Red,” waiting to greet them with his smiling face and big white shoes. Stepping into a new semester, Ms. McKearney invited each student to write a thank you letter to Mars Candy and draw a picture of “Red.” She mailed the collection to the company with a group photo of her class standing by their new adopted mascot. The story doesn’t end there…the company returned Ms. McKearney’s courtesy by sending each of her students a personally written letter, picture package of various M&M characters and best of all…a box full of yummy candy! If you have any M&Ms in your Halloween candy mix, enjoy their sweet taste and consider how you might use them as attention-getting tools. 1 Pings/Trackbacks for "M&Ms Please!"